An iconic tree in the upland South, the Aromatic Red Cedar (Juniperus virginiana) is found in middle Tennessee in abundance in the limestone karst soils of that area. An evergreen among largely hardwood forests, it was frequently planted near farmhouses and family cemeteries. Valued for its pungent odor and decay resistance, it was the wood used to line cedar closets and cedar chests. For flooring it makes a surprisingly hard and colorful choice, while its characteristic odor is subdued by the floor finishing process. 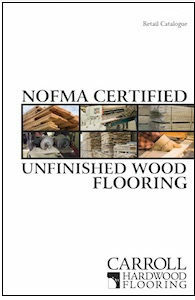 As a flooring material, Aromatic Red Cedar comes only in a Character grade. 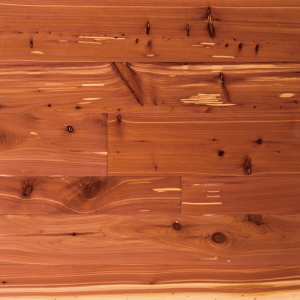 It is quite knotty but those knots are generally solid and help make Cedar an excellent choice for a sound, rustic floor. It is a distinctively deep red with a narrow ring of white sapwood that appears in flashes throughout the floor. Since it is a quite slow-growing tree, Cedar logs are relatively small and limit the widths and lengths in which the flooring is available. For unfinished Aromatic Red Cedar please call for a quote based on the quantity and width you have selected. Prefinished Aromatic Red Cedar is available in a Natural finish.